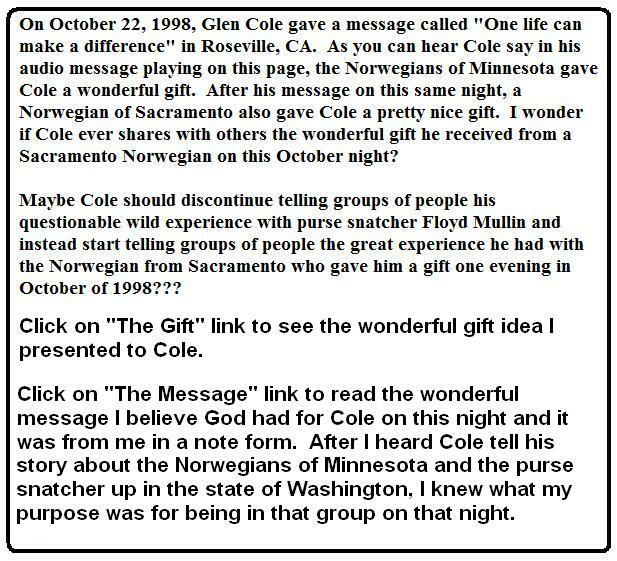 Here is just the audio of Cole talking about the gift the Norwegians of Minnesota gave to him. I liked the gift I gave to him and he didn't have to fly a Yumbo Yet to enjoy my gift. What's incredible about this experience is the fact I had no idea before arriving for this convention what Cole was going to be talking about during his message. I was home with my wife and decided (before we left our house to drive to Roseville for this convention) that I would take a Raley's history book, wrap it up like a gift, put a personal note inside and then find an appropriate time to give Cole my wonderful gift to him. How incredible that he starts off his message about the Norwegians of Minnesota giving him a gift. The Nordby's are Norwegians. So, after Cole was finished with giving his message, I went down and approached him at the front of the auditorium and I told Cole that I too was a Norwegian and I also had a gift for him. I also told Cole that his entire message was inside the gift. Cole smiled and thanked me for the gift. I asked Cole not to open the gift until he got home later that evening.......................do you think Cole waited until he got home to open the gift? What's also incredible is the fact that Cole's message starts off talking about Kish's son Saul in 1st Samuel 9 and then makes mention of verse "6" being the scripture he wants to focus on. Here are the numbers of interest: Charles Nordby had nine children and I was child number six. My middle name is "Samuel" In my note to Cole I state "My dad ran into a lot of jackasses in his life but he never ran into you." Was God asking me to go out on this night to seek out the lost "asses" and that is why I went to Roseville that night to give Cole my message and my gift? Then at the end of my note/letter to Cole enclosed within my gift, I sign it "a son of Charles Nordby." God truly had a message for Cole that night. I am sure Cole has never forgotten this night. In fact, I would eventually be the Norwegian asking him to verify his story about Floyd Mullin he gave on this night. In my opinion, Cole is one of the biggest "christian" phonies I have ever met in my life. He's right up there with Chuck Collings. And then the next day a grandson of Charles Nordby who didn't know what was given to Cole the night before, went up to Cole and asked him what he thought about the situation between Charles Nordby and Raley's. 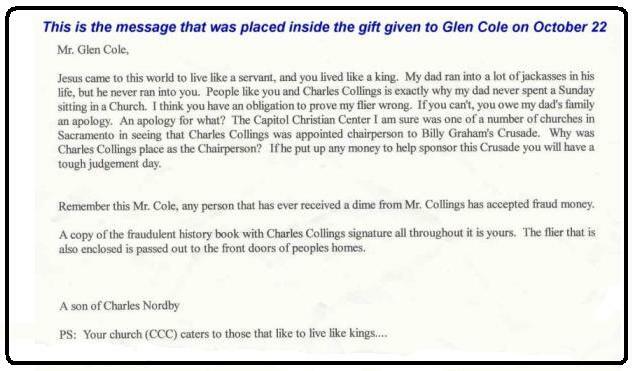 I know my note and gift must have really bothered Cole because Cole lashed out at Nordby's grandson by slandering Nordby---stating that Nordby was a liar, slanderer and doomed Nordby and his family to hell. Yeah right!!! Free-time for shoplifting, Mr. Cole! Also worth mentioning is the fact that in Cole's message about his trip itinerary to Norway he states, in humor, "On the sixth day, free-time for shoplifting." Once again, Cole is referring to the number "6" and shoplifting is a strange thing for anybody to make humor about. What's also interesting is that Charles Nordby spent his life catching shoplifters and dishonest people. I believe the Bible's eighth commandment says "Thou shall not steal." This entire meeting between Cole and me on October 22, 1998 was orchestrated by God! My wife watched me go down to Cole on this evening and hand him the wrapped up gift. Plus, there were other members of a church I was attending, present at this convention too, who witnessed me going down to give this gift to Cole. So hopefully Cole won't think I was just there in Roseville by myself to give him my gift. In Cole's story about the Norwegians of Minnesota giving Cole a gift to travel to Norway, what was the name of the jet that Cole and his wife flew on (first class) to get to Norway?